Guide managers can create new articles and edit all existing articles in the knowledge base. Agents who are not Guide managers can create and edit articles if they have management permissions. End-users can't contribute articles to the knowledge base. Note: Light agents on Guide Lite and Professional cannot create or edit articles. Light agents on Guide Enterprise and Legacy can create and edit articles where they have permission. You must have at least one section in the knowledge base before you can start adding articles. When you create an article, you must assign it to a section. For more information, see Anatomy of the Help Center. Guide managers can create new articles. Agents can create new articles if they have management permissions. Agent privileges for new articles vary depending on their management permissions. See the complete list of agent privileges for existing, published articles. You can create a maximum of 40,000 total articles, including translations. This limit includes articles in all states, except archived. In Help Center or Guide, click Add in the top menu bar, then select Article. Use the article editor's toolbar for formatting options or to add links, images, or tables. This toolbar is not the same as the toolbar in community posts. For information, see the Help Center article editor toolbar reference. See also Inserting links, Inserting videos, and Inserting images. For tables, check out this formatting tip. Edit the HTML source by clicking the Source Code button at the end of the editor's toolbar. Note: Help Center quarantines unsafe HTML tags and attributes to reduce the risk of malicious code. For information, see Allowing unsafe HTML in pages. Under Managed By, click the drop-down arrow, then select management permissions to determine which agents have editing and publishing rights for this article. Managers enables only Guide Managers to edit and publish the article. This option is selected by default on new articles. Editors and publishers (Enterprise only) enables all agents and managers to edit this article but only managers can publish the article. This option appears only if it's been activated. Custom management permission (Professional and Enterprise) enables specific user segments to edit and publish the article. Depending on your account, you might also see an agents and managers option. Guide Managers can apply any management permissions. Agents with management permissions can apply only the management permissions they belong to. Agents who do not have management permissions on any article will not see this option, and the management permissions will default to managers. Under Visible to, select one of the view permissions options to determine which users can view this article. Visible to everyone includes anyone who visits Help Center and does not require sign in. Signed-in users includes internal and external users who create an account and sign in to your Help Center. Agents and managers (Professional and Enterprise) includes staff members only, so that you can create content that is internal-only. Custom user segment (Professional and Enterprise) enables you to restrict viewing access to specific users based on tags, organizations, or groups by applying custom user segments (see Creating user segments to restrict access). Guide managers and agents with publishing permissions can set view permissions for articles. Agents who do not have publish permissions on any article will not see this option, and the view permissions will default to agents and managers. Under Publish in section, click Select a section, then select a new section and click Ok.
You can search for or navigate to the section. All of your categories might not appear in the window. To navigate, click the expander arrows to drill down to the section you want. To close the article for comments, deselect Open for comments. To promote the article in its section, select Promote article. To add an attachment, click Upload attachment on the lower side of the editor. The file size limit is 20 MB. 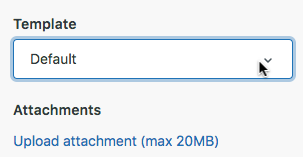 You can remove an attachment by clicking the x next to it. (Guide Professional and Enterprise) Under Labels, add any labels you want. As you start typing, a list of existing labels appears for you to chose from, or you can add a new keyword by selecting Add as a new label or by typing a word and pressing Enter. For more information about using labels and best practices, see Using labels on Help Center articles. You can add labels to the default language article only and not to translations of the article. You can add labels in multiple languages to the default article. (Guide Enterprise) Under Template, if you have multiple article templates in your live theme, click the drop-down, then select a template. You might have to scroll down to see this option. If you do not select an alternate template, the default article template will be applied. To save your new article as a draft or work in progress to publish later, click Save. Clicking Save creates the article as a draft (Guide Lite and Professional) or a work in progress (Guide Enterprise). Click the Preview in Help Center link (Guide Lite and Professional) or the Preview link (Guide Enterprise) to view the article in your Help Center. The preview link expires after one hour. To publish your new article, click the drop-down arrow on the Save button, then select Publish. Clicking Publish creates the article and publishes it in your Help Center. Click the Show in Help Center link (Guide Lite and Professional) or the Published link (Guide Enterprise) to view the article in your Help Center. 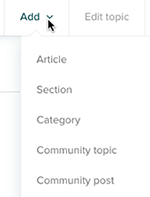 Tip: For information about how you can display an article in multiple sections, see Displaying an article or section in multiple sections or categories in our Support tech notes. Guide managers can edit any articles. Agents can edit existing articles where they have management permissions. Agent privileges for existing articles vary depending on their management permissions. See the complete list of agent privileges for existing, published articles. On Guide Lite and Professional, you cannot save edits for an existing published article. On Guide Enterprise, you can save edits for an existing published article as a work in progress. There are some article updates that you can make on multiple articles in bulk. For more information, see Updating knowledge base articles in bulk. In Help Center, navigate to the article you want to edit, then click Edit article in the top menu bar. Alternatively, in Guide, click the Manage articles ( ) icon in the sidebar, then select an article from an article list to open it in edit mode. Use the editor's toolbar for formatting options or to add code blocks, links, images, or tables. Note: Help Center quarantines unsafe HTML tags and attributes to reduce the risk of malicious code. For more information, see Allowing unsafe HTML in pages. On Guide Lite and Professional, click Save. The live, published article is updated in your Help Center. When you click Save, a work in progress is version is saved and the published version in your Help Center is unaffected. When you click Publish, the live, published article is updated in your Help Center. For information about staging content updates, see Staging updates for an existing article for review. Can you add images/icons to an article title? Hi George and welcome to the Zendesk community. Are you wanting to add an icon /image to all article titles or just certain ones. Also, are you wanting them to show on the home page, category page, sections page, or on the article page? I see this has been discussed before but I was curious if there are any plans to add the ability to save a Draft version of an already published article for publishing later? Whenever we have a big update that requires many articles to be updated, there is no good way to do it all at once. This seems like a common use case for many teams, staging updates. It would be really awesome if we could schedule updates to be published on a particular day/time but I can deal with manually doing it if we could just have draft revisions. The workaround to save the update, then revert back, then revert again later is clunky and obviously not the intended way to use it. For clarification: do you mean that you want to be able to basically duplicate an existing published article so you can edit/update it and then schedule it to go live at a later date, while the original version remains public? This is a very common scenario to have Draft - Edited & Saved - Published. That allows Agents/KMgr to get articles ready for publishing (such as a newsletter) and upon a particular date do the actual publish. Would love this ability. This workflow is supported by a beta that has not yet seen the light of day (as far as I know). Yes, many many of us are eagerly awaiting it. Yes, as Jonathan mentioned we have a beta just starting up for that. The beta should really get going this week as we add more users. Hi Jennifer - this is great news! I just signed up. We have an update later this month that will require an update to ~300 published articles... so if we can get a beta invite asap it would be really appreciated! My company has an app that has multiple versions (for different types of clients). Are there are any best practices on writing Help Center articles in a way to indicate if you are a user of this version, go here; a user of another version, go there? We are already using User Segmentation in another way, so I'm afraid we can't go that route. I want to make sure our clients don't get confused with our articles (because some may not pertain to them). Anything would help! Hi Hannah - I was going to suggest User Segmentation but since that's out of the question here a couple of different ways you could help your end users understand what version your articles relate to. 1. 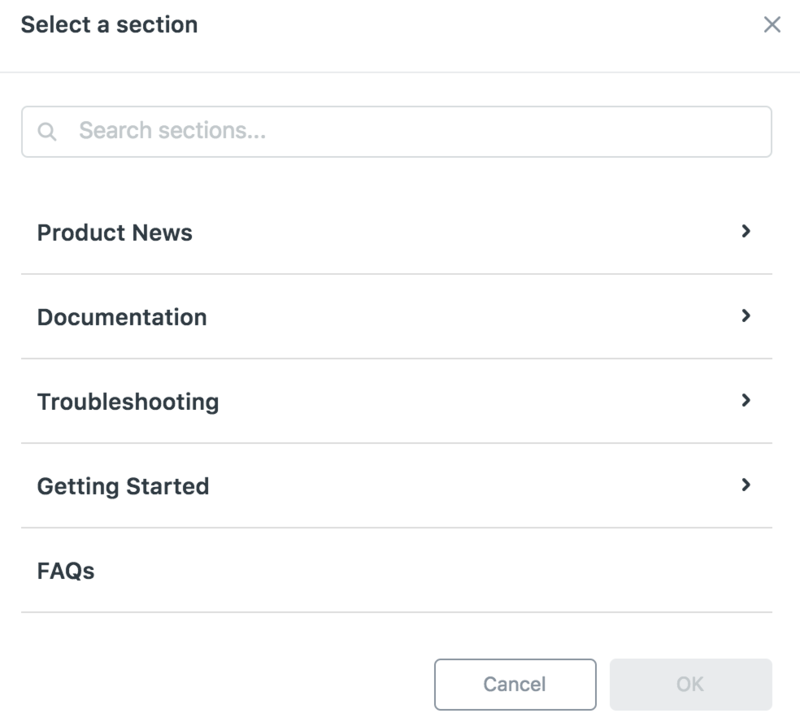 You could use sections to indicate a version of your software then put related articles under that particular section. Hopefully one of these options will work with as I've seen these two options while working with various clients. Thanks for those suggestions. I think the kicker here is that our users may not know which version they are on (they all belong in the same app). Have you run into that kind of scenario before? I am thinking we might need to introduce each product offering at the beginning of the question. Like "If your screen looks like this..., then....". Thoughts? @Hannah - Do you have the version a customer is on tagged for each user if so then you could display a message once they are logged in telling them what version they are on if not, I would have a promoted article or something that says "How to tell what version I'm on" with step by step instructions with screenshots or if you go the label route you could point that out. You could also have a note at the top of each article that states - "The content in this article is for v1,v2 users. Similar to what we do here in these forums. If you scroll up you will see notes as well as which plans this article relates to. Is there a way for me to put contact options at the bottom of each of my articles? I want the customer to be able to contact us (phone, chat, email) if the article doesn't answer their question and am trying to figure out the best way to easily do this within each article. We did something similar by adding a Feedback Survey to the bottom of our articles. First, we added the survey to the KB Article Template - that is always used for NEW articles. For existing articles, we had to go to each article and add to the HTML. Maybe there is a way to do that with API??? I'm trying to do something similar but involving icons. I've laid them out within a table but am unable to have them hyperlink into a phone/email/chat conversation. Any idea why the hyperlinks aren't working with these uploaded images? Can you show us the code you're using here? That should help us figure out what's going wrong! The "Inserting videos" link is not working. Thanks for letting us know about the broken link. It's fixed now!